A large part of Frankfurt am Main is being evacuated after the discovery of a World War II bomb on a building site in the Wismarer Straße. The bomb is a British HC-4000 air mine, also known as a “blockbuster” or “cookie”, and weighs 1.8 metric tonnes. It contains 1.4 tonnes of explosives, is 2m long and has a diameter of 76cm, although apparently part of it is missing. It is one of the largest unexploded bombs ever found in Germany, and as such making it safe is going to cause possibly the largest post-war evacuation the country has ever seen with at least 60,000 people having to leave their homes. On Sunday, 3rd September, 2017 anyone living within a 1.5km radius of the bomb will be required to leave their homes. At 4am the A66 motorway will be closed at Nord-West-Kreuz travelling into Frankfurt. At 6am police will seal off the area. By 8am residents must have left the area. Anyone who needs assistance or has questions should call 069 212111 on Saturday. Police will be using infrared cameras to detect body heat in buildings, to make sure that no-one hides and stays behind. They have the power to take anyone into police custody who then refuses to leave. After 8am the U-Bahn lines U1 and U2 will terminate at Hügelstraße. Lines U3 and U8 will terminate at Heddernheim. Line U9 will operate normally. The U4 will not be travelling between “Festhalle/Messe” and “Bockheimer Warte”. The U5 will not be travelling between “Marbachweg” and “Hauptbahnhof”. The U6 will not be travelling between “Zoo” and “Leipziger Straße”. 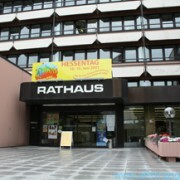 The U7 will not be travelling between “Hausen” and “Hauptwache”. The U-Bahn trains will have additional capacity before 8am to allow as many people to leave the city that way as possible. 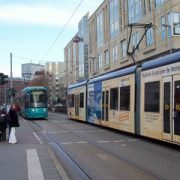 Tram 16 will not be travelling between “Adalberg-/Schlossstraße” and “Ginnheim”. Buses on routes 32, 34, 36, 64, and 75 will not be running at all. Route 50 will not travel between “Messe” and “Bockenheimer Warte”. The S-Bahn trains are not affected. At 12 noon the bomb disposal team will start work. If the wind is coming from the East, then there is a chance that flights to Frankfurt International Airport will be diverted as the flight path then goes over the affected area. It has not been announced whether they will be diverted to other airports, or use a different landing configuration. 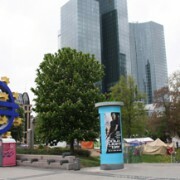 A number of hospitals are in the area, and these will also be evacuated, as will the German national bank (Bundesbank), the Palm Garden, the Goethe University, the Alte Oper, broadcaster Hessischer Rundfunk, and the police headquarters. The police have already sealed off the “Taunusblick” service station on the A5 to be able to use the area. 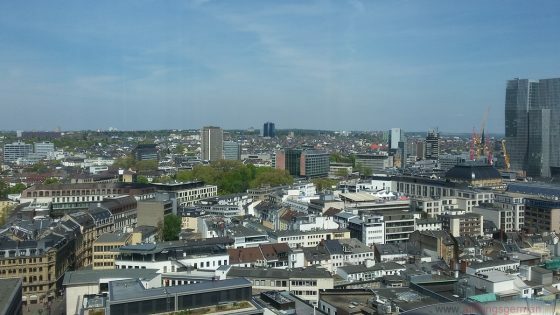 Hessischer Rundfunk will be evacuated to their Kassel studios, leaving an outside broadcast unit behind to cover the evacuation in Frankfurt. Their radio stations HR1, HR3 and HR4 will be broadcasting jointly on all three frequencies, with up-to-date information from how the evacuation and bomb defusal is going. It is hoped that it will all be over by 8pm. UPDATE: Frankfurt Fire Brigade reporting traffic problems near hospitals in the evacuation zone, asking drivers to avoid the areas. UPDATE: Police in Frankfurt are distributing flyers to houses that are going to be evacuated tomorrow. UPDATE: Anyone who has nowhere to go can go to the shelters at the Messe (Rooms 1.1 and 1.2, no parking available, use the City entrance) or the Jahrhunderthalle.